Shelter who illegally steals, or refuses to return children & teens therapy animals are looking for therapy dogs for vets. Still trying to get your mind around the title of this blog? After all, how can a shelter that steals, or refuses to return an animal back to a responsible loving home where they are therapy animals for children & teenagers want to help veterans with therapy animals? After veterans literally risked their lives for our freedom, which includes the right from having well taken care of and loved animals from homes and kids just to help generate their city money, illegal seizures, ect I doubt most veterans would appreciate that, or be ok with it? I think most veterans would be highly offended to know their new pet could possibly have been taken from a child, by a shelter who doesn’t abide by the laws. That is not only a slap in the face to families they were stolen from, therapy pets in general, but also to the veterans looking for therapy animals. The big question is do these agencies have a process in that place that does its research on shelters, rescues, and people they get their pets from to make 100% sure animals are not stolen, missing, or illegally seized pets that families? If not are they willing to add more into their screening process to combat these situations? As for MAS entering this program; that is a joke after wrongfully taking therapy animals from kids and teenagers just to generate more income for the broke and dwindling city it’s in. Especially now that same said broke city just raised the income tax on it’s citizens which will most likely make it harder for some to feed their pets, afford any medical treatment, ect. Perfect time to partner with this agency and begin “looking for” animals for it, and with all the one’s they “claim” are surrendered on a daily bases why they go through so many why would they have to look any further than their own facility? Where did all those pets go to? And how can they afford to remodel a new facility when they are constantly begging for money because they can’t feed animals (which is neglect) ect? Where did all the money go from illegal fines for animals they caimed were not vaccinated, which they had no legal authority to do? 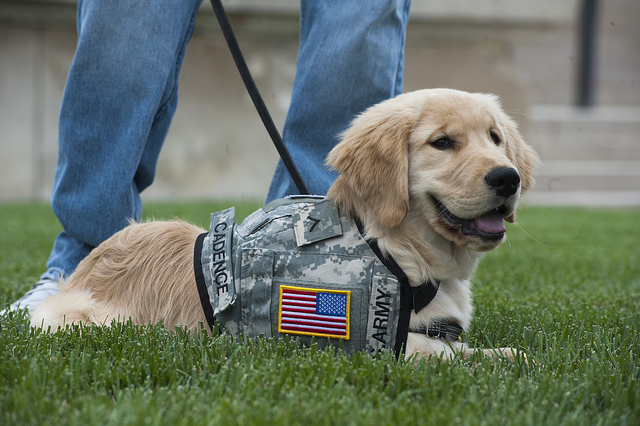 This article isn’t a knock towards helping veterans with therapy dogs because I fully support that, as long as those pets used were not stolen, or illegally seized from good homes, or are missing pets. I believe programs like this need to be informed and even helped with creating a new screening process for pets, shelters, and rescues they work with. I don’t believe a veteran would like having to face a court battle because they have a pet that belongs back with its rightful owners. I also doubt these agencies want to face legal issues over pets either. I suggest everyone who has missing pets, pets who were stolen, or those illegally seized begin educating these agencies, and veterans about this issues, you might just find your missed fur baby in the process. Here’s the million dollar question; how will they be “looking for pets in the community for this program? As the program rules says they do not accept pets from people? Will more dogs come up “missing”, “stolen” or “wrongfully & illegally seized” to “sell” (generate broke Muncie more income) to this program? Do they plan to violate the programs rule of no pets from people as it says they take pets from shelters? You can read the story here. I believe the article has the agency wrong though. It’s pets healing vets instead of pets for vets I believe but hope to get confirmation soon. FYI; the pigs used for wrestling were not set to be slaughtered after, they were owned and used by a company that uses them to travel to and be wrestled many times. You can view the petition here.